The weather warfare being waged against the US population continues to escalate. Due to the highly toxic fallout, weather warfare is also biological warfare against the entire web of life. 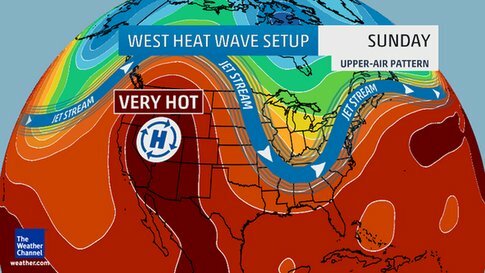 How hot is it going to be under the completely engineered high pressure heat dome in the West? Record shattering. 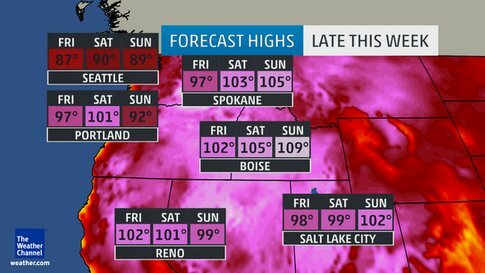 Is it any wonder the Western states are burning to the ground? The engineered high pressure zone facilitates the jet stream manipulation the climate engineers are after. By pushing the upper level winds up and over (north of) the heat dome, the winds then spin clockwise around the high pressure. A large “dip” in the jet stream is then formed, which contributes to yet another engineered cool-down in the Eastern US. Though the Western US could be considered a “climate sacrifice zone”, available data indicates the West is also a target for engineered drought. The latest NOAA map below will look very familiar to any that have reviewed my past articles documenting the geoengineering assault against the US, but this map is new and simply reflects the exact same climate engineering scenario being repeated again, and again, and again. The Western US is baked and burned while the Eastern half of the country gets the engineered cool-down. Each color shade in the NOAA map represents a deviation of 2-3 degrees or more above or below “normal” (depending on the shade). The West will be 20 to 30 degrees above normal, the East will be be nearly 20 degrees below normal. It is important to consider that “official” high temperatures are consistently being UNDERREPORTED by 4 to 5 degrees. This means it is actually far warmer than what is being disclosed (which is already at critical levels). How bad is the global climate situation? Much worse than most yet comprehend, this fact is now becoming all but impossible to hide. Americans in the Eastern US need to look at the global picture in order to gain an accurate perspective on reality. How cold is the rest of the world? 2014 was the warmest year on record and 2015 is on pace to shatter that record. The GISS surface temperature departure from normal map below represents the combined data for the past 2 years. 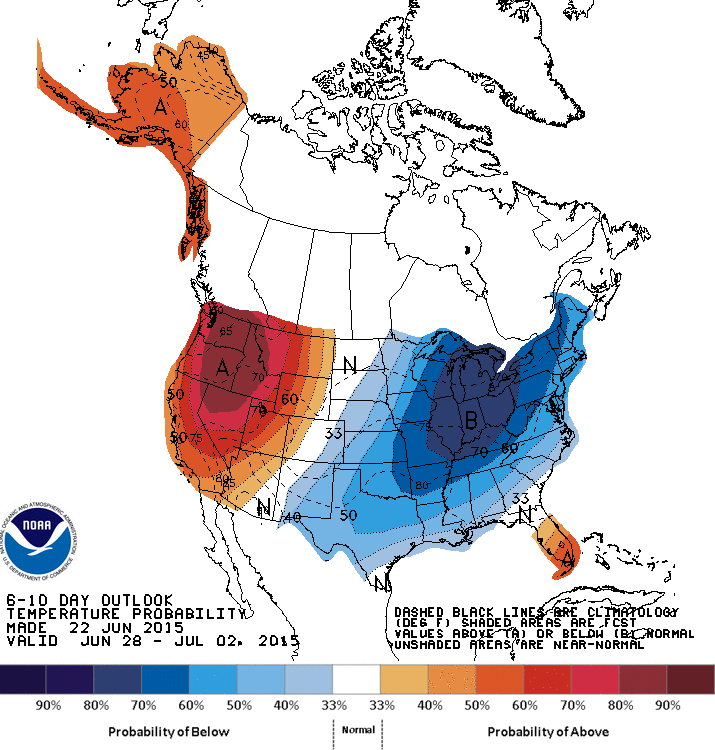 What is the most anomalously below normal temperature zone in the world? For over two years it has been the eastern half of the North American continent. The entire global climate system has been derailed, there is no completely natural or untainted weather, none. The ongoing scenario in the US lower 48 is as meteorologically unnatural as it is unprecedented. There are many agendas being carried out by the weather makers, one is the manipulation of US population’s perception of the climate. At the core of the weather warfare that is being waged is, of course, the agenda of total power and total control, this must always be remembered and considered. I have repeatedly documented the radical “fry/freeze” scenario being continuously engineered in the US lower 48. The climate science community, of course, will not speak about the geoengineering elephant in the room so they just claim not to know or understand why the Eastern US is cool while most of the world isn’t. The bottom line is this, we are all in a fight for life, every one of us is needed in the effort to sound the alarm. Exposing and halting climate engineering MUST be our top priority.